Apartments for Rent Windsor: Keep Your Apartment Safe This Winter! 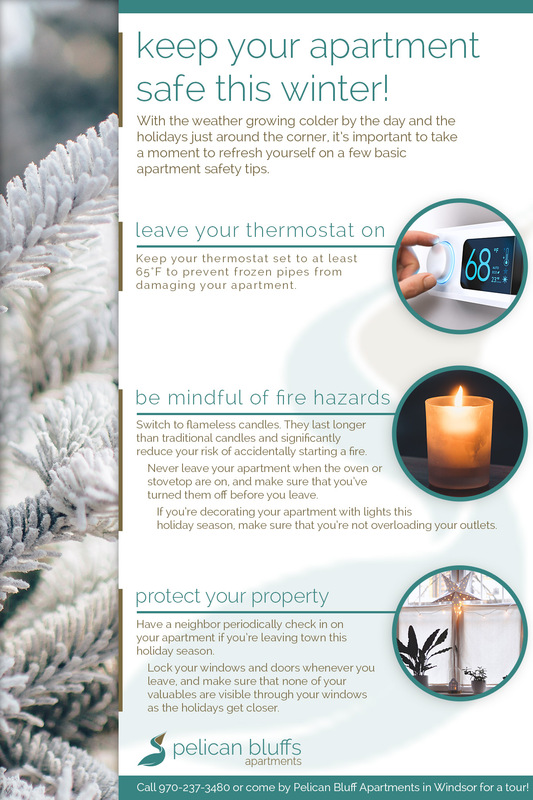 With the weather growing colder by the day and the holidays just around the corner, it’s important to take a moment to refresh yourself on a few basic apartment safety tips. 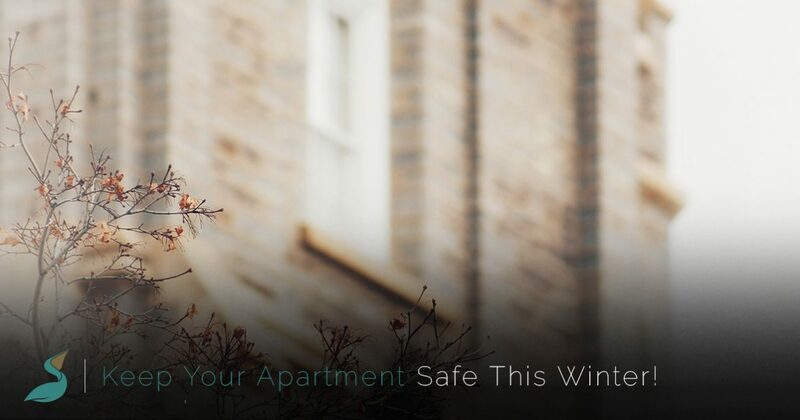 In today’s post, we’ll take a look a few ways you can keep your apartment safe this winter. When you’ve finished reading this post, contact Pelican Bluff Apartments to learn more about our apartments in Windsor! We have spacious one- and two-bedroom apartments for rent, and we know that you’ll love the amenities and our local area! If you’re like many Colorado residents, then saving energy and preserving the environment is one of your top priorities. At Pelican Bluff, we’re proud to have some of the best air conditioning and heaters you’ll find in any Windsor apartment complex. We’ve invested in efficient models that can quickly heat your home, and this makes it easy to keep your space comfortable without breaking the bank. If you work during the day or will be leaving to go on vacation this holiday season, make sure that your thermostat is set to at least 65 degrees Fahrenheit. This will ensure that none of the pipes in your apartment freeze and burst, which can significantly affect both you and your neighbors. Moreover, it actually requires more energy to heat up an icebox than it does to warm a slightly cooler room. Keep your thermostat at a modest temperature and watch your monthly utility bills decrease! Fire-related incidents peak during the winter months, and our top priority is to keep everyone in our Windsor apartments safe. If you’re cooking using the stove or oven, always make sure that you’ve turned off the burners and that they’ve cooled before you leave your apartment. Candles are one of the primary causes of apartment fires, and you can minimize your risk by switching to flameless alternatives. 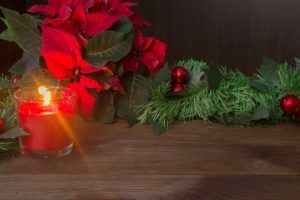 There are plenty of electric options you can choose from, and many of the flameless alternatives actually last longer than traditional candles. We know that many of our residents will be decorating their apartments this holiday season, and we can’t wait to see your holiday cheer! Always make sure that you’ve turned off your holiday lights before you leave your apartment, and never overload an outlet with more electronics than it can handle. When in doubt, invest in a power strip with surge protection. It’s unfortunate, but incidences of theft peak during the winter months. Thieves know that many people will be leaving town and filling their apartments with expensive presents, and you should always be mindful of your security during the holiday season. Double check that you’ve locked your windows and that you keep your door locked at all times, and let one of your neighbors know if you will be leaving town for more than a few days. They can keep an eye on your apartment and ensure that everything is exactly as you left it when you get back into town. Tour Our Windsor Apartments Today! Keep an eye on our blog, as we’ll be adding more information about how you can keep yourself and your apartment safe in the coming weeks and months. If you’d like to learn more about our apartments in Windsor, then fill out the form below or give us a call to request more information. We hope to see you soon!